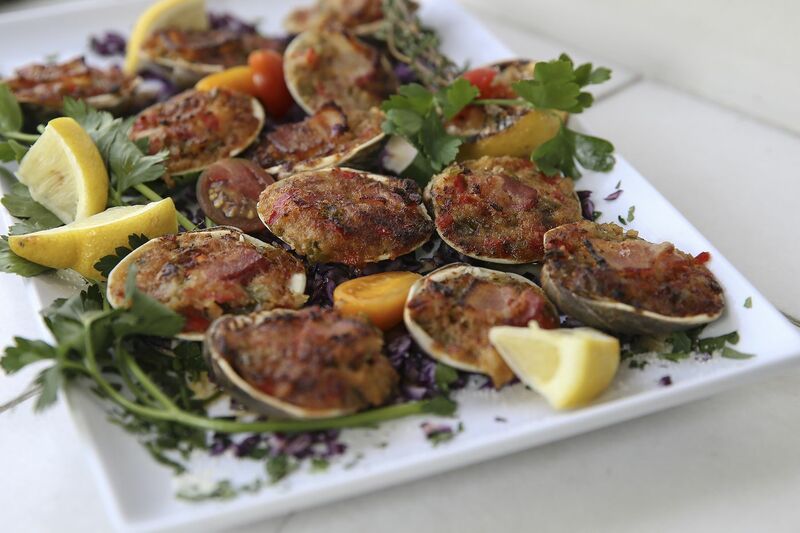 The clams casino at Scanicchio's. There is such a retro aura to everything about Scannicchio’s that it’s hard to imagine it hasn’t been at the corner of South Broad and Porter Streets for eons. From the vintage Sinatra portrait in back presiding over a room trimmed with white linen, Eagles banners, and year-round Christmas lights to the fra diavolo spice that gives the scungilli its lip-numbing sting and the swagger that lent our server’s mere mention of a nightly special — “saw-zidge 'n figs” — its unmistakable neighborhood flavor, Scannicchio’s is a throwback to an era when Italian restaurants like this bloomed across much of South Philly. Scanicchio's was opened in 2003 as a branch of the Atlantic City classic by the same name. Some other places have stuck it out and remained vibrant, like Ristorante Pesto and Paradiso, a pioneer of the East Passyunk revival that also has some more modern moves. But that old-school style has waned and shifted to the suburbs with generational migration. In the city, the best Italian kitchens have turned more directly toward regional Italian inspirations, and South Philly’s rowhouse neighborhoods have been reenergized with exciting new waves of immigrant flavors from Southeast Asia and Mexico. Co-owners and chefs Michael Gibson (left) and Christian Varalli in the kitchen at Scannicchio's. Chef and co-owner Christian Varalli arrived on the cusp of this big shift in 2003, when he opened a branch of the original Scannicchio’s, the Atlantic City institution that his dad, John Varalli, operated (commuting from South Philly) for 30 years until 2009. (The A.C. Scannicchio’s has resurfaced recently inside an A.C. bar called Lefty’s). Christian, 50, a St. John Neumann High School grad who grew up at 13th and Wharton and who spent summers riding the Faragalli’s bread delivery truck, was most certainly channeling the family’s big-flavored traditions. There are garlicky steamed artichokes whose leaves are cushioned with seasoned bread crumbs drizzled in creamy Pecorino sauce; the family “red gravy” recipe simmered down for hours with veal bones and pig’s feet; and what might be the best clams casino in town, their moist crumb stuffings crackling with a bacon-pepper savor and lots of minced clam. And from the start, it became one of the best stops on South Broad Street for pregame calamari (fried or stuffed) before heading to one of the stadiums. The success of Philly’s sports teams has been a boon to Scannicchio’s, too. Steamed artichokes stuffed with bread crumbs and Pecorino cheese sauce are among the most popular dishes at Scannicchio's. But embracing Scanicchio’s contemporary reality as part of a more diverse South Philly was also essential from the beginning. The first person in the neighborhood Varalli met when he took over the building in 2003 was a Mexican man named Oscar Perez who paused on his bike for a conversation. It was a lucky encounter. Sixteen years later, Perez is the lead sous-chef at Scannicchio’s, where five of his relatives also work: “They are like family now,” Varalli says. Server Marc Varalli, the owner's brother, prepares to take an order from diners at Scanicchio's. The pork chop lived up to its billing, a nearly one-pound hunk of prime-grade pig that managed to be both tender and juicy all the way through its two-inch girth. And that sweet-tart fig sauce is an essential flavor here, whether you get it over the chop topped with crumbles of Gorgonzola or as an appetizer tossed with heat-crisped rounds of Maglio sausage. It’s a family recipe that harks back to the days when Varalli’s Calabrese and Abruzzese grandparents would lean out the second-floor windows of their South Philadelphia homes to harvest fresh figs dangling off the big trees in their backyards. A juicy thick-cut pork chop is topped with figs in Varalli family tradition. I’m also a fan of Scannicchio’s take on Sicilian sauce, a colorful blend of hot and sweet peppers and olives in a lemony white wine sauce that soaks in enough tart zing from its cherry peppers to, as Christian says, “put a little sweat on your brow.” It’s a smart pork chop option, but also a classic choice for chicken. If real heat is your aim, though, the fra diavolo dials up the intensity with the spicy exclamation point of a grilled long hot that infuses the chunky marinara with a punchy burn that kept my fork coming back to the mushroom-like slivers of tender scungilli (conch) that’s a vintage favorite for regulars like Sal and Barbara Vetri (yes, Marc’s parents). "The Seven Fishes" seafood pasta medley is one of Scannicchio's signature dishes. There are plenty of other typical seafood options here, though I had some mixed success with that portion of the menu. The tender fried calamari, simply crisped in seasoned flour to order, were a fresh-ingredient reminder of why that now-ubiquitous dish (often made elsewhere from frozen tubes) became such a widespread obsession to begin with. The clams casino, as noted before, are a must. On the other hand, a baked branzino shaped into a basket around cherry tomatoes and a white confetti of less-than-awesome crabmeat was dry and overcooked. The restaurant’s signature “seven fishes” showpiece, a Christmas Eve seafood feast piled into a single dish, was about abundance more than finesse. There were some gems within the heap, especially the little clams, big sweet scallops, abundant mussels, and impressively tender stewed squid. But the linguine (never spaghetti for the Varalli family) was mushier than I like. (“Al dente” is not a trend Scannicchio’s has yet embraced.) And if I never see another puny prefrozen lobster tail broiled to rubbery oblivion then splayed atop a dish as a crowning flourish, I’d consider it progress — even if that means six fishes rather than seven. Chicken Parmigiana is a well-rendered classic worth savoring at Scannicchio's. What Scannicchio’s does best, in my mind, is simply honor some of the familiar touchstones with good ingredients and an experienced hand. Like the creamy but zesty Caesar dressing over greens that had a pleasantly bitter snap. Or the brightness of fresh lemon juice (and briny capers that haven’t been oversteeped) in a delicate piccata sauce for the lightly flour-dusted chicken breasts. I also admired the balanced texture and flavors of the meatballs, a well-seasoned blend of beef, veal, and pork softened with milk-soaked bread. They came cloaked in a red gravy enriched for hours with roasted marrow bones and pig’s feet, a tradition passed down on Varalli’s Calabrian side that adds an extra depth of savor. That gravy, which isn’t as dark as some ragus I’ve tasted and which still retains the sweetness of its Saporito tomatoes, was a bright addition to some outstanding renditions of Parmesan, which brought a perfectly crisped chicken breast so large it covered the entire plate, and a piece of veal that was pounded but still thick enough to appreciate the meat’s quality. The ice cream cookie sandwich. With a creamy wedge of coffee-soaked tiramisu and a scoop of hazelnut gelato sandwiched between crunchy pizzelle cookies for sweet emphasis, that throwback sensation is one I’m sure many experience at Scannicchio’s. And it’s an essential legacy worth preserving while the rest of South Philly changes dramatically around it. Come for the “saw-zidge n’ figs,” stay for a taste of old-school South Philly Italian flavors at this friendly corner BYOB. Regulars come for the stuffed artichokes, piled-high seafood pastas and “Italiano” chops as co-owner and chef Christian Varalli pays homage to his dad’s longtime Atlantic City institution. Over its 16 years on South Broad Street, Scannicchio’s has remained one of the best of a dying breed of legacy Italian American kitchens while also embracing its place in the neighborhood’s increasingly diverse landscape of newer immigrant flavors. It’s a great place near the stadiums to pregame on fresh calamari — if you’re lucky enough to get a table. MENU HIGHLIGHTS Stuffed artichokes; clams Casino; sausage with figs or broccoli rabe; fried calamari; scungilli fra diavolo; mozzarella- eggplant stack; meatballs and pasta; manicotti; gnocchi alla Gorgonzola; seafood alla Scannicchio; veal Saltimbocca; stuffed veal chop special; pork chop Italiano (or topped with figs and balsamic); chicken Sicilian; chicken piccata; pizzelle gelato sandwich. BYOB This menu descends from Calabrese and Abruzzese family recipes, so wines from those regions in Southern and Central Italy (Gaglioppo from Cirò; Montepulciano; Nerello Mascalese; Trebbiano; Pecorino) are always a smart move. WEEKEND NOISE The room gets lively, especially before games, but the persistent Sinatra soundtrack (and conversation) is usually easily audible. IF YOU GO Dinner Monday through Thursday, 4:30-9 p.m.; Friday and Saturday, until 9:30; Sunday, 3-8 p.m.
Dinner entrees, $15.95-$35. (Specials can be higher). Not wheelchair accessible. There is one step at entrance, and bathroom is not wide enough for wheelchair.